A police corruption procedural drama, Pride And Glory flirts with a promising premise, but fails to deliver any new angles and dissolves into sub-standard territory. The New York City police department is thrown into turmoil when four officers on the anti-narcotics unit are killed in a shootout with criminal Angel Tezo and his gang. The slain men all reported to Francis "Franny" Tierney Jr. (Noah Emmerich), a well-meaning commanding officer and the son of Police Chief Frank Tierney Sr. (Jon Voight). 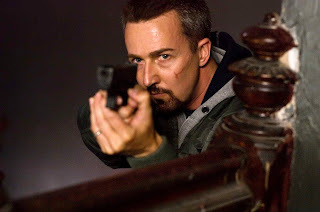 Frank Sr. convinces his other son Ray (Edward Norton) to help in the shooting investigation. Ray previously was involved in the drug wars, but grew disillusioned when he was embroiled in a false testimony scandal. 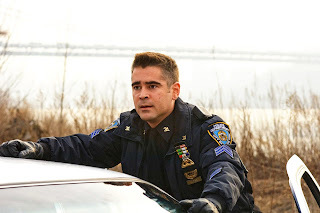 Officer Jimmy Egan (Colin Farrell) is a member of the anti-drug squad, and is also the brother-in-law of Franny and Ray. Jimmy is the informal leader of a group of corrupt officers receiving large payments from drug dealers. The four officers were killed because Jimmy was trying to squeeze out Tezo in favour of Casado, another crime king. Ray reluctantly starts his investigation, and it does not take him long to uncover the ring of corruption within the police department, triggering a moral and familial dilemma involving Ray, Frank, Franny and Jimmy. Treading over the well-worn territory of honour, deep-seated corruption, and the police officer's unspoken code of conduct, Pride And Glory adds the interesting twist of multiple members of the same family embroiled in a swirling controversy triggered by the slaughter of four officers. But the promising start slowly but surely gives way to sideways drift, and eventually the movie arrives at a complete stall. The screenplay by Gavin O'Connor and Joe Carnahan fails to capitalize on the set-up, leaving the characters undeveloped and the actors struggling with plenty of tough words but little context. The film defaults to a series of scenes with men angry at each other and doubling up on threats, but the details of the corruption, the motivations and the backstories are at best hinted at and more commonly just ignored. There are a few action scenes but these are more muddled than effective, director Gavin O'Connor proving incapable of adding any zest to the proceedings. The frazzled ending, once it arrives after an overlong 130 minutes of running time, is a disastrous mano-a-mano fist fight followed by a botched robbery and a flash mob that just happens to be at the right place at the right time to tidy up the plot in a most unsatisfying manner. Edward Norton is the one actor to emerge with any credit, and he tries to infuse Ray with some self-reflection and evidence of a troubled past to round out the character. Jon Voight, Colin Farrell and Noah Emmerich are sturdy but hampered by the unimaginative writing. The women in the lives of the police officers are reduced to the bittiest of meaningless roles, the opportunity to properly delve into family pressures once again registering as a bad miss. Pride And Glory flickers early, but is then extinguished into blandness and is ultimately as forgettable as its title.